What does it take to make a great restaurant? 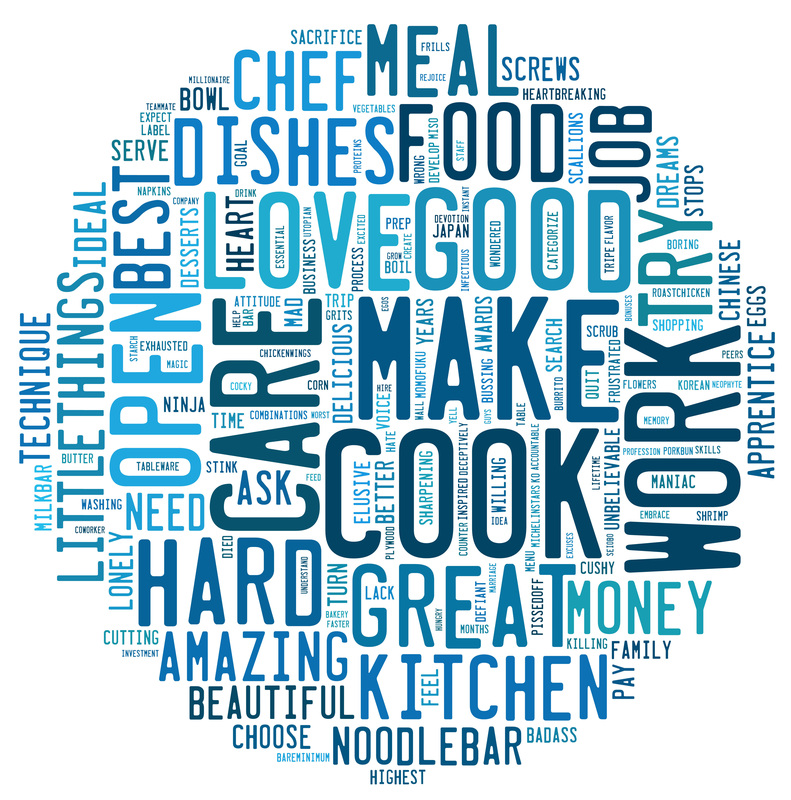 From this Word Cloud, based on our interview with David Chang, chef/owner of Momofuku restaurant group, for our book, “The Art of Doing,” we can see what matters most to this award-winning Korean-American restaurateur. Frequency is the currency of a word cloud. The more a word is repeated, the larger it appears in the cloud. Click here to see the interactive version. What does it take to make a great restaurant? From this word cloud, based on our interview with David Chang, chef/owner of Momofuku restaurant group, for our book “The Art of Doing,” we can see what matters most to this award-winning Korean-American restaurateur. Rather than the reality TV caricature of a pathological screaming chef, Chang’s focus on words such as ‘work,’ ‘love,’ ‘good,’ ‘care,’ ‘make,’ ‘hard,’ ‘great’ and ‘open’ reveal his obsessive devotion to food as well as those who prepare and eat it. His concern for co-workers, customers and all that occurs within his kitchens and what goes out of them borders on the religious. His words even hint at the feelings of a doting mother serving her family. Is it any wonder that the combination of Chang’s priestly devotion, his culinary brilliance and killer work ethic is impressing critics, attracting talented staff and feeding a growing number of happy customers in country after country? 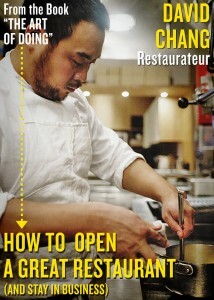 Read our story on David Chang and “The Secret Ingredient for Success” in The New York Times here. Check out artist/illustrator Scott Menchin’s Art of Doing Artist Interpretation of David Chang here. Buy the book here. Follow us on Twitter here. Join “The Art of Doing” Facebook community here.